Remember in January, when I said I was going to knit 12 pair of socks this year? It's May, so I should have 4 complete pair of socks by now. And I only have 2.5. And the sad thing is, the 2 complete pair look suspiciously similar. They're actually 2 different socks, but both use chevron patterning. You may recall the first pair I completed were the Achilles Heal socks. This time, it's Jaywalkers. 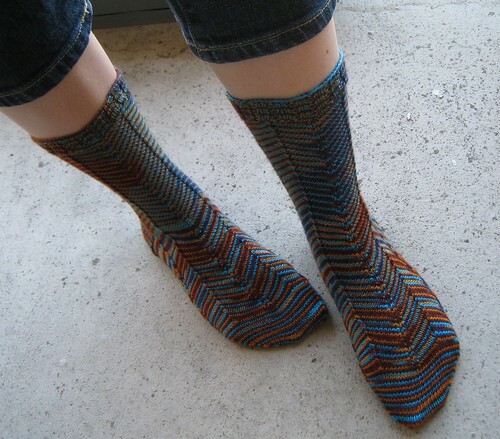 I first tried to knit these socks in July 2009. This may seem like an oddly specific thing to remember, but I remember quite distinctly because I was mugged in Belize and my socks, yarn and DPNs were stolen by some jerk who also managed to run up a $75,000 (yes, that's 3 zeros) cell phone bill (which of course I was not responsible for, but it never would've happened in the first place if AT&T had turned off the phone when I called and say "Hey, I'm in foreign country and some jerk just stole my cell phone!"). I loved the way that stolen sock was working up, so it took a long time to come to terms with its loss and try again. But I'm glad I did, because as far as sock patterns go, it was engaging yet not overly complicated, and the socks are fun! I used a yarn that's been sitting in my stash for quite a while, from the now-defunct Blue Hands Fibers. A few years ago, the dyer, Denise, had a contest to win a yarn club membership, and I won! This quite variegated skein had been sitting in my stash ever since, waiting for the perfect project to come along. It's made a bright, playful pair of socks, and soft too. 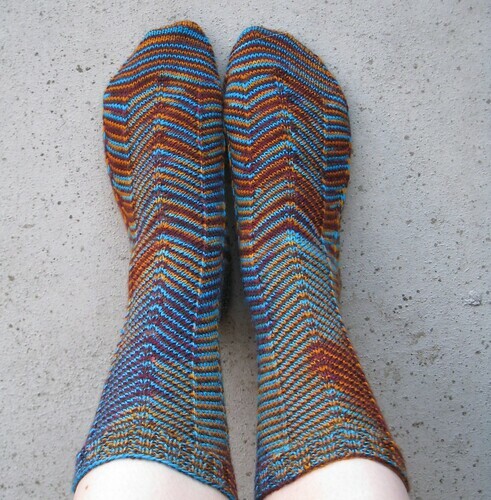 While I adore these, I'd also like to try knitting these socks with thicker stripes. My original attempt was using Knit Picks Felici, which I think fits the bill. Just give me another three years to get back to the pattern. Blog readers who visit my page directly may have noticed new tabs at the top: Reviews and Tutorials. They're a bit empty now (you'll find my sock yarn review in there), but I hope to be adding content in the very near future. In the meantime, if anyone wants to send me anything to review (books, yarn, family cookie recipes, your latest haircut), just shoot me an email.